UU A Way Of Life: What do you find most true, most beautiful, most good? 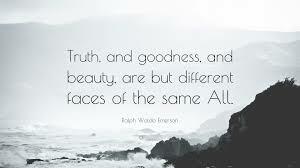 What do you find most true, most beautiful, most good? Roman Catholicism has described truth, beauty, and goodness as the "transcendentals." Unitarian Universalism often relies on the transcendentalists as prophetic women and men who have contributed to the living tradition of UU. In the pursuit of truth and meaning, paths into the true, beautiful, and good have provided sustenance for the search and journey. Psychotherapists focus on the three aspects of the human personality: thoughts, feelings, and behavior. In the world of values we name truth, beauty, and goodness as the pivotal touchstones of our consciousnesses. These values correspond to the aspects of the personality: our thoughts desire truth, our feelings desire beauty, and our behavior desires goodness. When we apply this trinity to the spiritual life we can wonder: what is truth, what is beauty, and what is goodness? What are the circumstances and factors that contribute to experiencing these three qualities? It is the pursuit of the truth, beauty, and goodness that comprises the spiritual life and the life worth living. Wherein do these three qualities lie? In my life, my truth is found in _____________________________. In my life, beauty is most intensely experienced in ____________________________. In my life, goodness is found in ________________________________. In other words, what is the most important truth for you? What is the most beautiful for you? What is the most good that you appreciate most?